A curious cub and a sky-watcher contemplate the stars. �Be quiet, Crackle,� Dreamflight said fondly and ruffled the cubling�s hair. Already losing count, Crackle sighed deeply and leaned back on her elbows, then gave up on it and just fell back and sprawled wide and felt grass against her back and in her hair and under her shirt. She turned over on her belly, and then there was grass tickling in her bellybutton. On exposed hilltops, where there weren�t a lot of trees, grass thought it could grow every-which way and thickly without taking responsibility for itself, and Crackle picked at it looking for hidden treasure. �If you lie on your stomach you�ll miss all the stars,� Dreamflight said. She lay on her back, of course, her golden hair like a halo for her pale face. Her hands were folded on her chest. Her voice was soft and dreamy. It was a glorious, moonless night, the heavens as black as the inside of her eyelids. Stars were everywhere, so thick Crackle imagined them as a trail of milk that someone accidentally spilled all over the sky. Dreamflight laughed a bit. These things always made Dreamflight laugh. That was one of the reasons Crackle loved following her around, because she laughed and smiled easily and liked to listen, and she knew all the best places where the sky was wider and greater than the ground, so wide it curved like a great, star-littered bowl. 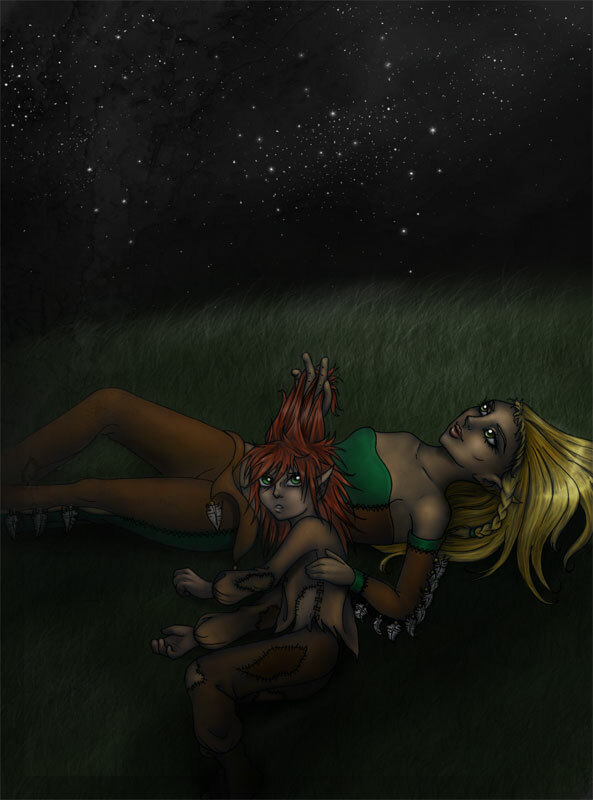 Sometimes Dreamflight�s eyes would close and she would start humming, or whistling or singing softly to the stars like a strange, lilting night-bird, and Crackle would join in and feel like the night was warm all around them. Sometimes Dreamflight would sigh instead, but never more than once, and by the time Crackle curled up next to her all warm and soft to hug and make better, she�d be smiling again, which was always confusing. Smiling, Dreamflight turned over to lie on her belly and pick at the grass next to Crackle, legs kicking up in the air. �You found milk there?� She teased. Crackle made a face. �Not in the grass. In the sky. Maybe that�s what the stars are. Special sky-milk. From the sky-wolf. It got spluttered all over when � when � � she grasped for a plotline. The older elf shook her head, her hair gold against black. �That�s too silly, kitling.� She ruffled Crackle�s hair again. �Maybe it�s a very big circle,� Dreamflight theorized. Crackle�s eyes widened. �You think so?� She shot an unsure, even vaguely apologetic look at Muddypaws. She fell silent. Uncharacteristically, Crackle didn�t speak, not even to ask a question, although she was immediately wondering where the sky did end and what was past it. Something had to be, she knew it, and it filled her with an excited dread. To her surprise, she felt Dreamflight�s ribs rise and fall with a sigh. She had a feeling that she didn�t really understand why Dreamflight leaned up then and looked at her, or why the fisher smiled. It was this odd smile. It must�ve been a grown-up thing. Crackle wasn�t sure how anyone could smile, really smile, and be sad at the same time, but she thought it might be a little like the stars, too. �Yes, Crackle?� She ruffled her hair a third time.